UPDATE - I now believe this video is a fake - sort of, it's actually showing a LED monitor and not an OLED one. More info here. The video has been removed since, in any case. 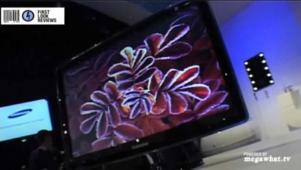 This OLED monitor has got a contrast of 2,000,000:1, is only 1.6cm thick, and should be out in 2010. It is very light, should save around 40% of the energy compared to normal LCDs, and has HDMI and DVI Inputs. WARNING: LED not equal OLED!! it can be fake. because the viewing angles are limited. it's lcd w/ led backlight. you see the comments in site of youtube. therefore you remove this topic!! Nuninho1980 - I believe you are right. This is a LED and not OLED. I have updated a posted about this. Thanks for commenting!